Orange Is the New Black and Glee Stars Join The Wiz Live! How many stars can The Wiz Live! pack into one live show? Tons. On top of having Queen Latifah, David Alan Grier, Mary J. Blige and Stephanie Mills, the show has now added stars from Glee and Orange Is the New Black. 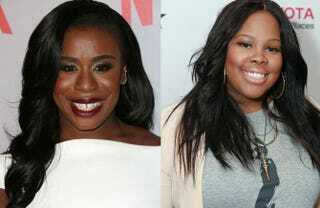 Uzo Aduba from Orange Is the New Black and Amber Riley from Glee have joined the cast as witches. Aduba will play Glinda, the Good Witch of the South. Riley will play Addaperle, the Good Witch of the North. The casting seems to be wrapping up, with the Tin Man and Scarecrow the last two major cast members that haven’t been announced yet. Earlier this week, Shanice Williams, a relative unknown, secured the role of Dorothy.